Honey bees (Apis mellifera) are facing multiple stressors affecting their lifespan, health and productivity. Among them, Nosema ceranae is an intracellular microsporidian parasite, which plays a major impact on honey bees colonies. However, both efficiency and innocuity of current treatment against N. ceranae are being questioned, thus raising the urgent need to develop alternative prophylactic and curative strategies. Endogenous microbial communities (i.e., host microbiota) are known to play a major role in disease prevention, and more recently both bacterial and yeast strains issued from gut microbiota were observed to improve hosts resistance against intracellular parasites both in mammals and insect models. The use of probiotics in honey bee nutrition is therefore promising to treat or prevent diseases. Therefore, further investigations are needed to properly select microorganisms with probiotic properties. In an in vivo experimental infection by N. ceranae, the probiotic effect of two honeybee gut bacterial strains (Parasaccharibacter apium (PC1 sp.) and Bacillus sp. (PC2 sp. )), and two broad spectra probiotics (Bactocell® and Levucell SB®) has been measured. Both curative and prophylactic administrations were tested: honey bees infected with N. ceranae and non-infected. For the four probiotic candidates, significant increases of survival probabilities (20–30%) were measured after two weeks of treatment with the administration of 103 CFU/mL in sugar syrup, both in curative and prophylactic treatments. The present study shows that endogenous bacterial strains were at least as much efficient and safe than broad spectra probiotics in increasing survival in the context of experimental infection with N. ceranae. Therefore, taking advantage of beneficial host microbiota properties is a promising avenue to develop efficient and sustainable curative strategies against opportunistic diseases in honey bee colonies. The European honey bee Apis mellifera is the most important pollinator present in the agricultural (Alberoni et al., 2016) environmental and economic sectors (Klein et al., 2017). Over the last few decades, major mortalities in honey bee colonies have been reported globally (Fairbrother et al., 2014; Vanegas, 2017). With the intensive exploitation of honey bees for the pollination of agricultural crops, bee colonies mortality is more accentuated in some area as Europe and US than in others part of the world. Although the stock of honey colonies is increasing, it fails to meet our actual needs (Aizen and Harder, 2009; Smith et al., 2014). Numerous studies agree that synergetic interactions between multiple abiotics (Doublet et al., 2014; Alburaki et al., 2015; Kakumanu et al., 2016; Poquet et al., 2016; Li et al., 2017; López et al., 2017) and biotics stressors (Goulson et al., 2015; Dussaubat et al., 2016) are involved as major causes of bee colonies decline (see also reviews by Fairbrother et al., 2014; Alberoni et al., 2016; Sánchez-Bayo et al., 2016; Klein et al., 2017). Synergies between many of these factors have a strong negative impact on immune defense (Nazzi et al., 2012; Di Prisco et al., 2013), metabolism (Koch and Schmid-Hempel, 2011; Dussaubat et al., 2013; Bordier et al., 2017), and on bees cognitive mechanisms (Klein et al., 2017). Now, honey bee gastrointestinal microorganisms (i.e., gut microbiota) are known to play a critical role in regulating specific functions associated with metabolism and immune response (Evans and Lopez, 2004; Alberoni et al., 2016; Hyrsl et al., 2017). Microbial symbionts participate in various processes such as digestion of food (Koch and Schmid-Hempel, 2011), detoxification of harmful molecules, supply of essential nutrients, participation in the host's defense system (Lemaitre and Hoffmann, 2007; Hooper et al., 2012), and protection against pathogens and parasites (Evans and Lopez, 2004; Flint et al., 2012; Engel and Moran, 2013; Alberoni et al., 2016; Chaplinska et al., 2016). Although our understanding of mechanisms underlying interactions between the intestinal microbiota and parasites is still partial, it is widely acknowledged that the composition of the intestinal microbiota is a key factor in controlling infection dynamics (Berrilli et al., 2012). To this respect, members of the gut microbiota, including parasites, can be either beneficial, neutral or harmful to their host (Engel and Moran, 2013). Furthermore, according to the host physiological state, some strains can shift from opportunistic to infectious when the host is stressed (Boutin et al., 2013), and potentially favor parasite infections. Nosema ceranae is an obligate intracellular microsporidian parasite, which is the causative agent of one of the most prevalent honey bee disease, called nosemosis (Higes et al., 2008). Honey bee's infection occurs by proliferation of N. ceranae spores in the midgut after the incorporation of infected food (Ptaszynska et al., 2014) and spore accumulation is often associated with mortalities (Higes et al., 2007, 2008, 2009; Martín-Hernández et al., 2007). Nosemosis disease is involved in physiological and behavioral perturbations in the honey bee colony (Leoncini et al., 2004; Goblirsch et al., 2013) like the disruption of the pheromone production, the ethyl oleate (EO). Ethyl oleate (EO) is involved in the behavioral maturation, in the transition from hive work to foraging activities (Leoncini et al., 2004; Dussaubat et al., 2010, 2013) and suppression of the cellular immune response (Antúnez et al., 2009). Nosemosis is also correlated with a modification of the natural feeding behavior of honey bees, making them less cooperative to participate in trophallaxis process (Naug and Gibbs, 2009). Nosema ceranae infection mainly impacts colony robustness (Cox-Foster et al., 2007; Antúnez et al., 2009): infected honey bees are more susceptible to other pathogens (Mayack and Naug, 2009). Furthermore, spore accumulation is suspected to cause gut microbiota dysbiosis and to impair the defense system of the host (Alberoni et al., 2016). Dussaubat et al. (2012) showed that N. ceranae triggers inhibition of gene expression involved in the regeneration of the gut epithelial tissue (e.g., Wnt signaling pathway), which in turn could affect the ecological niche of beneficial host microbes. Gut epithelial tissue damages are symptoms of intestinal diseases, including diarrhea. Overall, intracellular intestinal protozoan parasites impact can be extremely damaging, especially in individuals who have weakened immune system (Vitetta et al., 2016). Given that modern agroenvironments exert a strong negative impact on immune defense, (Alaux et al., 2010; Di Prisco et al., 2013), it is not surprising that nosemosis prevalence is rapidly increasing (Higes et al., 2008). Current treatment against nosemosis homologated in many countries (for example USA and Canada) is the antibiotics Fumagillin-B® and Fumidil-B® (Van Den Heever et al., 2015). Unfortunately, Nosema spp. strains are showing various levels of antibiotic-resistance (Huang et al., 2013) and several studies have measured reduced Fumagillin-B® efficacy on both N. apis and N. ceranae infections (Pajuelo et al., 2008; Williams et al., 2011). For this reason, Fumagillin-B® was recently banned in the European Union (Gisder and Genersch, 2015) like in France in 2002 (Fernandez and Coineau, 2007). Furthermore, antibiotics showed to disrupt host microbiota equilibrium by killing endogenous bacteria (Aguilera et al., 2013; Li et al., 2017). Moreover, antibiotics were observed to increase the susceptibility to Nosema infection, thus inducing a negative impact on the honey bee lifespan (Li et al., 2017). Therefore, there is a need to develop effective and sustainable alternative strategies to maintain or restore intestinal flora homeostasis. Alternatively, beneficial microorganisms (i.e., probiotics) were successfully used as therapeutic tools in animal production (Hamdi et al., 2011; Alberoni et al., 2016). Oral administration of probiotics has showed a protective effect on the intestinal microbiota of the host (Gismondo et al., 1999). In murine models, both bacterial and yeast probiotic strains have also proven their effectiveness against intracellular parasites and showed positive improvement of the health of host (Alak et al., 1997, 1999; Benyacoub et al., 2005; Humen et al., 2005; Shukla et al., 2008; Dinleyici et al., 2011). Concerning honey bees, endogenous gut bacteria belonging to Lactobacilliaceae, Bifidobacteriaceae, and Acetobacteraceae families have been found to play an antagonistic role against N. ceranae, either in caged bee trial or in field conditions, by reducing the spore load (Sabaté et al., 2012; Audisio et al., 2015; Baffoni et al., 2016; Corby-Harris et al., 2016). Our research goal focused in comparing the probiotic potential of two endogenous strains [Parasaccharibacter apium (PC1 sp. ), Bacillus sp. (PC2 sp.)] and two commercial probiotics strains (Bactocell® and Levucell SB®, Lallemand Inc.) as an alternative treatment against N. ceranae infections in honey bees. These four probiotic candidates were targeted either for their proven or putative probiotic properties. The endogenous strains [P. apium (PC1 sp.) and Bacillus sp. (PC2 sp.)] are respectively closely and distantly related to strains that have been successfully used to inhibit honeybee disease (Sabaté et al., 2009; Yoshiyama and Kimura, 2009; Corby-Harris et al., 2016) and to enhance colony performance (Sabaté et al., 2012). Parasaccharibacter apium (PC1 sp.) belongs to the Acetobacteraceae family, which is particularly abundant in honey crop, hypopharyngeal glands, royal jelly, and larval gut through nurse worker bees feeding behavior (Corby-Harris et al., 2016). Overall, commensal Acetobacteraceae affect tissue development in insects such as in Anopheles mosquitoes (Chouaia et al., 2012; Mitraka et al., 2013) and control maturation of gut immunity, such as in Drosophila melanogaster (Ryu et al., 2008). Then, Bacillus sp. (PC2 sp.) belongs to the phylum Firmicutes and more specifically to the Bacillus genus. Bacillus species are dominant in the honeybee stomach (Wang et al., 2015). This genus can survive at high temperatures and pH and is usually harmless, with the exception of B. anthracis and B. cereus (Sabaté et al., 2012). Administration of Bacillus strains helped the development of bee colonies by enhancing the brood and also honey yield (Sabaté et al., 2012). Concerning the commercial strains, Bactocell® (Pediococcus acidilactici), is a Lactobacillaceae that is used for a wide range of host species: pigs, chickens, shrimps, and salmonids (EFSA, 2012). Bactocell® was demonstrated to improve the laying performance of hens (Denev et al., 2013), the survival rate, and the growth of the shrimp L. Stylirostris (Castex, 2009). Lactobacillacea strains are used as probiotics formulations in animals (Nikoskelainen et al., 2003; Bovera et al., 2012; Piccolo et al., 2015; Billiet et al., 2017) and in honey bees (Evans and Lopez, 2004). Interestingly, a decrease of Lactobacillaceae sp. was correlated with unhealthy honey bees (Cox-Foster et al., 2007; Olofsson and Vásquez, 2008), thus highlighting the important role of this bacterial family in honey bee health. Levucell®SB (Saccharomyces cerevisiae boulardii) is used for monogastrics (swine and chicken) to improve growth performance, gut histology (Le Bon et al., 2010), decrease carriage of foodborne pathogens (Mountzouris et al., 2015) and improve immunity response (Collier et al., 2011). Moreover, other studies showed positive impact of commercial probiotic on bee host (Kazimierczak-Baryczko and Szymas, 2006; Ptaszynska et al., 2016). Consequently, we decided to test the impact on honey bee health of two commercial strains, Bactocell® and Levucell®SB that showed beneficial effects on other animals. The main objective of the present study was to compare the survival of young caged bees fed with two endogenous honey bee gut bacteria (PC2 and PC1) and two commercial probiotics (Bactocell®, Levucell SB®, two trademarks of Lallemand Inc.), experimentally infected by N. ceranae. This work is one of the very first studies comparing commercial probiotics, which usually have a broad host range, with honey bee endogenous strains, to assess whether beneficial members of the commensal gut microbial community perform better both in prophylactic and curative conditions. The motivation of this study is that probiotic curating strategies based on broad range commercial probiotic strains such as acid bacteria commercial strains such as L. rhamnosus and Lactobacillus sp. were not able to prevent nosemosis, and disrupted the honeybee immune system (Andrearczyk et al., 2014; Ptaszynska et al., 2016). Moreover, Andrearczyk et al. (2014) observed an increase of Nosema spp. infections in young honeybees fed with commercial Lactobacillus sp. and Saccharomyces cerevisiae probiotic strains. Finally, some cases of commercial probiotic induced microbiota-host perturbations were documented (Doron and Snydman, 2015; Durchschein et al., 2016). Taken together, this suggests that some broad range probiotics are not necessary suitable for the honey bees nutrition (Andrearczyk et al., 2014). The present study shows that both endogenous bacterial strains were at least as much efficient and safe as broad spectra probiotics in significantly increasing survival in the context of experimental infection with N. ceranae. Sixty healthy adult worker honey bees were collected from five different colonies at the Centre de Recherche en Sciences Animales de Deschambault (CRSAD, Deschambault, Qc, Canada) and transported alive to the Institute for Integrative and Systems Biology (IBIS) in Quebec city, Canada. Upon arrival, whole bee guts were removed from the abdomen. Bee guts were then macerated, vortexed and placed into a sterile 10 mL Snap-cap tube (Sarstedt Inc. No. 62.554.002 PP*) filled with 5 mL of PBS 1X (Phosphate buffered saline). Gut bacterial community was prepared for culture by using several dilutions (10−1 to 10−4) from the starting volume of PBS 1X. Then, 100 μL of these different dilutions were transferred onto petri dishes of Tryptic Soy Broth agar (TSB) (Difco Inc.) and on De Man-Rogosa-Sharpe agar (MRS) (Difco Inc.), both incubated at 37°C for 48 h under aerobic conditions. After 48 h, individual colonies were picked and transferred to new agar plates to obtain pure strains. Each strain was transferred in a 2 mL cryotube for long-term storage by adding sterile glycerol to a final concentration of 15%; frozen samples were stored at −80°C for further molecular characterization and culture. For DNA extraction, isolated strains were sampled from their specific media. Then, DNA was extracted using the Dneasy Blood and Tissues kit (Qiagen Inc., 2016) as indicated in the manufacturer's protocol with the following modifications: cultured strains were suspended in 200 μL of PBS 1X followed by a thermal shock at 95°C for 5 min. Next protocol steps were completed as indicated in the manufacturer's protocol (Pretreatment for Gram-Positive Bacteria In DNeasy® Blood & Tissue Handbook. 2006). For the PCR amplification, 16S rRNA gene was targeted using the universal bacterial primers (Sigma-Aldrich,Genosys) F-Tot (5′-GCAGGCCTAACACATGCAAGTC) and 1389R (5′-AGGCCCGGGAACGTATTCAC). The PCR was conducted in a total volume of 50 μL: H2O 18 μL; TaKaRa Taq 25 μL, F-tot (10 μM) 25 μL; 1389R (10 μM) 25 μL; DNA 2 μL. After initial denaturation at 95°C for 2 min, amplification was performed using 30 cycles of 1 min at 95°C, 1 min at 55°C and 1 min 30 at 72°C followed by a final extension at 72°C for 5 min. Then, amplification products were run on 2.0% agarose gels and sent to the “Plate-forme d'Analyses Génomiques” of Laval University for a Sanger DNA sequencing. Taxonomic identification of 16S rRNA gene sequences was completed using the BLAST sequence analysis tool of NCBI databases. Endogenous bacterial strains used in this research were obtained from the glycerol stock (storage at −80°C) and streaked on Tryptic Soy Broth agar (TSB) or De Man-Rogosa-Sharpe agar (MRS) plates. Plates were incubated at 37°C for 48 h under aerobic conditions. After 48 h, 5–6 colony-forming unit (CFU) were inoculated in 10 mL of sugar syrup (1:1, w:v). In parallel, commercial probiotics were also inoculated in 10 mL of sugar syrup (1:1, w:v). Subsequently, 1 mL cultures of each solution (syrup sugar + CFU) were plated on MRS and TSA agar medium, depending on the bacterial strain, at T = 0, 48 h, 72 h, and 1, 2, 3 weeks in triplicate. All plates were incubated at 37°C for 48 h under aerobic conditions. Survival of two endogenous and two commercial probiotics in sugar syrup was measured by counting CFU after 2 days of incubation on their respective culture media. Experiments were conducted at the Centre de Recherche en Sciences Animales de Deschambault (CRSAD, Deschambault, 46°40′26.85″N, 71°54′54.39″W), Québec, Canada. The effect of endogenous and commercial probiotics against Nosema spp. infection was investigated in vivo on adult honeybees, maintained in cages under laboratory conditions. All bees used in this study originated from four European honeybee colonies (A. mellifera L.) headed by sister queens in September 2015. Accordingly to the methodology described by Williams et al. (2013), five combs of capped brood with dark eyes and gray skin pupae were transferred in a “nursery colony” that consisted of a Langstroth hive body with a frame of honey and pollen for food supply. To obtain newly emerging bees, the nursery colony was placed in an incubator (model 3040, Forma Scientific Inc., Ohio, U.S.A.) adjusted at 35°C and 55% relative humidity for 6 days. Young bees of 4–6 days old were placed in a 4 frame hive body before being randomly distributed to cages. Each cage consisted of a 14 oz. single-use plastic ventilated cup (Evans et al., 2009) and an inverted sterile syringe (20 mL, BD, Franklin Lakes, New Jersey, U.S.A.) containing sucrose syrup. Bees rapidly learned to take the syrup from the bottom opening of the syringe. Twenty bees were randomly distributed in each cage and all cages were kept in an environmentally controlled room (30°C ± 1°C and 50% ± 5% relative humidity) in total darkness for the duration of the experiment (27 days). Cages were randomly distributed in each experimental group (Table 1) and treatments begun on day 0. Each experimental group was composed of 20 cages. Five cages per experimental group were sampled each time. There are four treatment groups, one per probiotic strain: Bactocell®, Levucell SB®, PC1, and PC2. For each treatment group there are two conditions, curative vs. prophylactic administration, and two controls: with and without Nosema, therefore totalitizing 10 experimental groups. Table 1. Experimental groups (20 bees in each cage for a total of 400 bees in each experimental group). To induce Nosemosis, N. ceranae spores were obtained directly before experiments from naturally infected honey bee ventriculus as described by Fries et al. (2013). To insure homogenous experimental infection of Nosema across experimental group, Nosema spore concentration in sugar syrup was checked three times before administration. To ensure that all bees had low Nosema infection level, we used newly emerged bees (4–6 days old) from healthy colonies, which were checked by PCR for Nosema prevalence. One micro liter of a sucrose syrup (1:1, w:v) containing 1 000 000 Nosema ssp. spores were administrated orally to Nosema group cages on day 0, with the inverted syringe. Following spore administration, endogenous or commercial probiotics were fed according to protocol with a dose of 103 CFU per mL. Commercial probiotics Bactocell® and Levucell® were supplied by Lallemand Inc. (Lallemand, 2016, Montréal, Québec, Canada) while endogenous probiotic candidates were isolated from healthy adult honeybee guts (as described in previous section). Each probiotic strain was mixed thoroughly in sucrose syrup (1:1, w:v). Sucrose solution was replenished weekly with a freshly made solution in all cages. Every 2 days, the number of dead bees was recorded in each cage to evaluate mortality rate in each group. On day 0, 50 bees were sampled to assess N. ceranae infection. Then, once a week until day 27, five cages per group were randomly sampled, and bee samples were stored at −80°C for further genomic analyses and evaluation of N. ceranae presence in honeybee gut. Total DNA for each sample (a pool of 5 bees per cage, 5 cages per experimental group) was extracted from intestinal honeybee using a rapid salt-extraction as described in (Aljanabi and Martinez, 1997) with some modifications. Intestinal tissues were removed from the bees stored at −80°C and placed into a 1.5 mL microtube. We added 440 μL of sterile salt homogenizing buffer (0.4 M NaCl 10 mM Tris–HCl pH 8.0 and 2 mM EDTA pH 8.0), 40 μL of 20% SDS and 8 μL of 20 mg/mL proteinase K (400 μg/mL final concentration) in the 1.5 mL microtube and vortexed for few seconds. Next, the samples were incubated at 60°C for at least 1 h and vortexed every 20 min. Then, 300 μL of 6 M NaCl was added to each sample followed by a centrifugation for 20 min at 13,300 rpm at 4°C. The supernatant was transferred in a new 1.5 mL microtube. After this step, 600 μL of cold isopropanol was added and incubated at −20°C for 30 min. Centrifugation was repeated before collecting the supernatant. This step was repeated twice, and the pellet was dried overnight. The dried pellet was suspended in 100 μL of sterile water and stored at 4°C. Then, N. ceranae was detected by PCR amplification. The Nosema gene marker was targeted using the primers (Sigma-Aldrich, Genosys), L203 (5′-CAGTTATGGGAAGTAATATTATATTG) and R253 (5′-TTGATTTGCCCTCCAATTAATCAC). The PCR was conducted in a total volume of 50 μL: Non- acetylated BSA (1 mg/mL) (20 μL; dNTPs (2.5 mM) (4 μL); Forward primer, L203 (3 μM) 2.5 μL; Reverse primer, R253 (3 μM) 2.5 μL; MgCl2 (25 mM) (2.5 μL); reaction buffer (10X) (Feldan); Taq (Feldan (10 U/μL) 25 μL, H2O 12.2 μL and DNA 1 μL. After initial denaturation at 94°C for 2 min, amplification was performed using 29 cycles of 45 s at 94°C, 45s at 56°C and 45s at 72°C followed by a final extension at 72°C for 5 min. Then, amplification products were run on 2.0% agarose gels for the detection of the specific 250 pb DNA fragments, together with a 100 pb DNA Ladder. Total RNA for each sample (a pool of 5 bees per cage, 5 cages per experimental group) was extracted from intestinal honeybee using TRIzol® Reagent protocol from Invitrogen (Chomczynski, 1993) as described in Boutin et al. (2015). Complementary DNA (cDNA) was synthesized using qScript™ cDNA SuperMix (Quanta Biosciences). A total RNA of 0.5 μg was mixed with 4 μL qScript™ cDNA SuperMix and a variable volume of nuclease free water to obtain 20 μL as total volume, following the manufacturer's instructions (Quanta BioSciences, Inc. 2013). Then, standard PCR was conducted on Sigma (Biometra® T1 plus thermocycler, Montreal Biotech Inc.) PCR was carried out in a total volume of 12.5 μL: TaKaRa 6.25 μL; Primer M3_325_Fw (5′-GAAGCCGGCATCGTGGCCTG) (Sigma-Aldrich, Life Science) 1.25 μL; Primer M3_325_Rv (5′-ATGTACACGGCATCTGTCCA) (Sigma-Aldrich, Life Science)) 1.25 μL; cDNA template 1.875 μL and H2O 1.875 μL. After initial denaturation at 94°C for 1 min, amplification was performed using 41 cycles of 30 s at 94°C, 30 s at 60°C and 45 s at 72°C followed by a final extension at 72°C for 10 min. Detection was realized on genomic DNA, using extraction protocol as described in Aljanabi and Martinez (1997) followed by two successive DNA purifications and a standard PCR conducted on Sigma (Biometra® T1 plus thermocycler, Montreal Biotech Inc.) PCR was carried out in a total volume of 12.5 μL: TaKaRa 6.25 μL; Primer B3_339_Fw (5′-AAAAACTCGGTGGCGTAATG) (Sigma-Aldrich, Life Science) 1.25 μL; Primer B3_339_Rv (5′-TCAACACCTTTTAAGGGTGC) (Sigma-Aldrich, Life Science)) 1.25 μL; DNA template 1.875 μL and H2O 1.875 μL. After initial denaturation at 94°C for 1 min, amplification was performed using 26 cycles of 30 s at 94°C, 30 s at 60°C and 45 s at 72°C followed by a final extension at 72°C for 10 min. Then, amplification products were run on 2.0% agarose gels for both endogenous probiotic. For each experimental group, five bees from one cage were randomly sampled and pooled together to detect N. ceranae occurrence using an adapted protocol derived from Fries et al. (2013). In summary, we proceed as follow: All materials were cleaned with 70% ethanol. The five dissected abdomens were grinded into 5 mL of distilled water within a mortar using a pestle. Then, large debris were removed and mortar contents were poured into a 10 mL flacon tube and stored overnight at 4°C. Next, spore counting was performed using a hemocytometer grid. The hemocytometer grids were sterilized with 70% ethanol and a KimWipes™, then the preparation was homogenized manually by vortexing. Afterwards, a glass coverslip was put over the hemocytometer grid. Then, 20 μL of each pooled sample were placed into the hemocytometer. The hemocytometer was placed on an optical microscope equipped with a 400x magnification lens for observation. All the analyses were performed at day 14 (bees age = 18–20 days) of the experience. For the spore loads count, pools of 5 bees per cage were analyzed. Spore counting was performed in duplicate to reduce variability (Figure 1). Estimation of the number of spores per bee gut were calculated with the following formula: [(Raw spore count from 5 blocks) * 50.000)] = number of spores per bee. Figure 1. Estimation of the number of spore per bee in each experimental group: pictures were taken from an hematocytometer placed on an optical microscope equipped with a 400x magnification lens for observation. Five bees per experimental group were grinded together. For spore counting, we used 5 blocks (four blocks localized in the grid corner and the one in the 5 × 5 grid centrum). Each block represents 4 × 4 grids (16 squares). Pictures illustrated in this figure represent one of the smaller 4 × 4 grids (16 squares) from the 5 × 5 grids that are used for spore counting. Survival analysis of the in vivo experiment was performed with the Kaplan-Meier Method using R language (R Development Core Team, 2008). Kaplan-Meier analysis illustrates survival probabilities of bees between groups during the 27 days experiment by taking into account the censored data that represent sampling of cages during the in vivo experiment. Data mortality registered for each cage was formatted using script from our group and survival individuals were analyzed using “Survival” R package. Survival curves of multiple groups were obtained with the Kaplan-Meier (Kaplan and Meier, 1958) formula (fitted Cox model). Kaplan-Meier estimate generally assumes independence among the individual death events. In order to determine over time and for specific time if there is a statistically significant difference between control (non-infected group) vs. experimental group (curative and prophylactic groups) and within experimental groups we performed a Cox's proportional hazards regression using the coxph function in R. The hazard function or death rate is the instantaneous probability of death for individuals still alive. The Cox regression model estimates the hazard ratio of dying when comparing treatment vs. control (non-infected group). The P-values from the Cox model summary indicate the significance of differences between compared groups (Package survival, R). Nosema prevalence was assessed by quantifying the number of N. ceranae spores per bee and per cup independently for each experimental group at day 14. The significance of differences between our collected data was evaluated by using a Variance test (test ANOVA) in R (Tables 2, 3). Table 2. Spore counts statistics on infected groups with Nosema ceranae. Table 3. ANOVA on spore counts in infected groups with Nosema ceranae. A single factor analysis of variance (ANOVA) was performed to test whether significant differences in terms of survival differential occurred between prophylactic (i.e., probiotic vs. control) and curative (i.e., Nosema + probiotic vs. Nosema control) use of the four probiotic strains (Table 7). We showed that the amount of CFUs for both endogenous and commercial probiotic candidates were stable after 3 weeks in the sugar syrup (1:1) (sugar:water), thus confirming that the syrup formulation was suitable for the administration of the four probiotics candidates. After 3 weeks, a ten-fold decrease of CFU counts was recorded for the four probiotic candidate strains. To be conservative, the syrup formulation (1:1) (syrup sugar + CFUs) used in this study was renewed weekly. Nosema ceranae was unambiguously identified with the amplification of a taxonomic marker (See methods). At T0 (prior to Nosema infection), diagnostic PCR was negative. N. ceranae spores were recorded neither in control (non-infected group) (group 1) nor in probiotic controls (group 3, 5, and 9) at day 14. A minimal occurrence of spore was however observed in the Bacillus, probiotic candidate (group 7). Then, strong occurrences of N. ceranae spores were recorded in all of the infected groups (2, 4, 6, 8, and 10; See Tables 2, 3; Figure 2). Figure 2. Spore counts per bee in the experimental groups infected with Nosema ceranae. Fifteen bees sampled at day 14 were analyzed (5 bees per experimental group, one cage per experimental group). During this 27 days experiment, cumulative mortalities were recorded every 2 days and survival probabilities for each group were estimated by comparison of the Kaplan-Meier curves obtained and illustrated in Figure 3. Figure 3. Kaplan-Meier Survival curves distribution of bees in each experimental group during the 27 days cage bee experiment. The y-axis represents the Kaplan-Meier estimates of the survival probabilities. The x-axis represents the experimental days. (A) Effect of Bactocell® administration (prophylactic: Bactocell® group and curative: Nosema + Bactocell) on honeybee survival. (B) Effect of Levucell® administration (prophylactic: Levucell group and curative: Nosema + Levucell) on honeybee survival. (C) Effect of PC1 sp. (Parasaccharibacter apium probiotic candidate) administration (prophylactic: PC1 sp. group and curative: Nosema + PC1 sp.) on honeybee survival (D) Effect of PC2 sp. (Bacillus probiotic candidate) administration (prophylactic: PC2 sp. group and curative: Nosema + PC2 sp.) on honeybee survival. Significant differences of survival probabilities between all groups were found from the second week of the experiment (day 8 to day 14) to the last day (day 27). Table 4 shows the Cox model comparisons of survival probabilities between control group (non-infected group) and all others groups. On day 25, all groups receiving probiotic candidates exhibited significantly higher survival rates compared to the control group (non-infected group; Table 4). Cox Proportional Hazard model comparisons showed that honey bees infected with N. ceranae had a significantly lower survival probability than bees from the control group (non-infected group) on day 18 (13.5% less), 25 (10.6% less), and 27 (9,5% less), evidencing the negative effect of N. ceranae infection on honey bee survival. Table 4. Cox Proportional Hazard model (Cox-model) comparisons between survival of the control group (ctrl) and Nosema group and experimental groups with curative administration of tested probiotics during the 27 days experiment. Overall, honey bees receiving a prophylactic administration of Bactocell® and Levucell SB® had a significantly higher survival probability than the non-infected control group (Cox-model, Figures 3A,B). From day 14 to day 27, survival probabilities of bees receiving a prophylactic dose of the commercial probiotic Bactocell® were significantly higher than those of control group bees receiving sucrose syrup. At day 18, bees have a significant higher survival probability (Kaplan-Meier curves, + 30%) than bees from the control group (54.2% ± 2.49 and 83.0% ± 1.89, respectively for control and Bactocell® group). 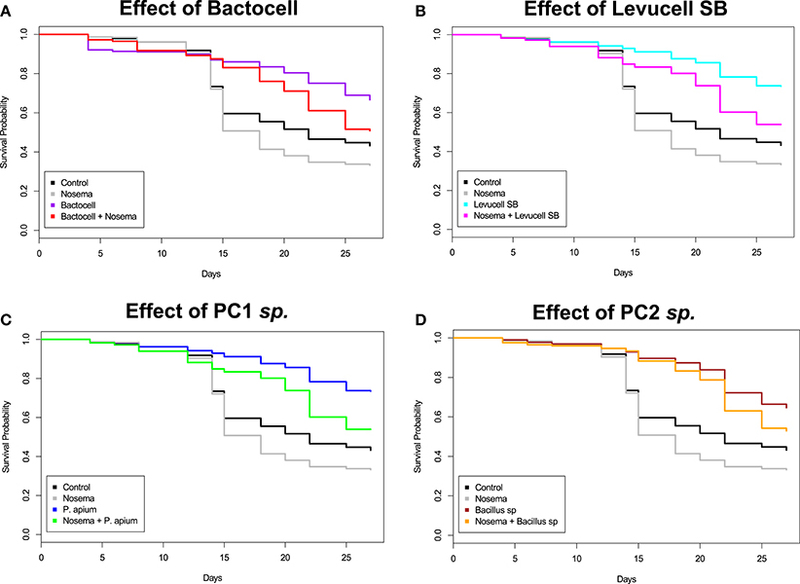 Similarly, honey bees fed with the commercial probiotic Levucell SB® also showed a significantly higher survival probability when compared to the control group at day 8, 14, and from day 20 to 27 (Figure 3B, Table 5). On day 22, survival probability of bees receiving a prophylactic dose of the commercial probiotic Levucell SB® was 75.4% ± 2.15 compared to 45.5% ± 2.49) which is a significant increase of 29.9% of survival rate. Table 5. Cox Proportional Hazard model (Cox-model) comparisons between survival of the control group (ctrl) and probiotic controls groups during the 27 days experiment. Overall, honey bees receiving a prophylactic administration of endogenous probiotics PC1 and PC2 had a significantly higher survival probabilities than bees of the non-infected control group, from the third week of the experiment (Table 5) to the last day (day 27). On day 22, honey bees receiving a prophylactic dose of PC1 had a significant increase of survival (Cox model, + 30%), when compared to survival of the control group (75.5% ± 2.09 compared to 45.5% ± 2.49). Prophylactic administration of the PC2 candidate also correlated with significantly higher survival probabilities on day 14 and 20 to 27 when compared to the control group. The highest survival difference was recorded at day 20: 83.0% ± 1.88 of bee receiving a prophylactic dose of the PC2 candidate survived, while 50.5% ± 2.5 of bees of the non-infected control group survived. Bees receiving a curative administration of Bactocell® after N. ceranae infection (test group 4) showed significant higher survival rates than control group (non-infected group) and Nosema infected control group bees from day 14 to the end of the in vivo experiment (Tables 4, 6, Figure 3A). On day 22, Kaplan-Meier curves indicate a survival rate of 34.2% ± 2.37 for Nosema control group and 60.5% ± 2.43 for the Nosema + Bactocell® test group (i.e., group receiving a curative dose of Bactocell®), representing a survival increase of 26.3%. Identically, Nosema + Levucell SB® test group showed significant higher survival rates than in Nosema control group. On day 14, survival rates were 71.0% ± 2.27 for the Nosema control group and 87.0% ± 1.68 for the Nosema + Levucell SB® test group, representing a survival increase of 16%. On day 22, bees from the Nosema + Levucell SB® test group had 75.4% ± 2.15 survival rate compared to 34.2% ± 2.37 for Nosema infected group, which is 41.2% higher. Table 6. Cox Proportional Hazard model (Cox-model) comparisons between survival of the artificial Nosema infection groups (Nosema ctrl) and experimental groups with curative administration of tested probiotics during the 27 days experiment. The survival probabilities of bees receiving a curative administration of the endogenous probiotic candidate PC1 after an artificial infection of N. ceranae (Nosema + PC1 test group, group 6) showed significant higher survival probabilities compared to Nosema control group bees (group 2) from day 14 to day 27 (Table 6, Figure 3D). Survival rates were significantly higher in the group 6 compared to group 2 from day 14 until the end of the experiment (32.7% ± 2.35 and 53.5% ± 2.49). Finally, infected bees receiving the endogenous probiotic candidate PC2 (Nosema + PC2 test group, group 8) showed a significant increase of survival from day 14 to day 27 (Table 6, Figure 3C), compared to Nosema control group. At day 27, a significant survival increase of 19.9% (52.6% ± 2.57% vs. 32.7% ± 2.35) was observed for the Nosema + PC2 test group. Significant differences regarding survival differential between prophylactic groups (i.e., probiotic vs. control) and curative groups (i.e., Nosema + probiotic vs. Nosema control) were detected from day 15 onwards. Survival differential between curative and prophylactic groups was significant for Levucell SB® at T15, T18, T20, T22, T25. For PC2, survival differential between curative and prophylactic groups was significant at T15, T18, T25. Finally, for Bactocell®, survival differential between curative and prophylactic groups was only significant at T25. The results clearly showed that both prophylactic and curative administration of all the four probiotics candidates, either with broad host range and endogenous, significantly increased honey bees survival rates from 20 to 40% when compared to the non-infected control group. For a prophylactic administration, highest survival rates were obtained for (in decreasing order): PC1, Bactocell®, Levucell SB®, and PC2. For the curative administration, highest survival rates were obtained for (in decreasing order): Levucell SB®, PC1, PC2 and Bactocell®. However, there was no significant difference in terms of survival improvement between commercial and endogenous probiotic candidates. Regarding the patterns of survival rates, a drastic decrease was observed at day 14 in both control and Nosema control. From day 14 to the end of the trial (day 27), the Nosema control group survival was always lower than the control without Nosema, thus confirming that Nosema infection exerted a negative effect on survival. Furthermore, this drastic decrease did not occurred in the groups fed with probiotics, either with or without Nosema infection. This result strongly suggests that probiotics were very efficient to improve bee survival both in curative and prophylactic mode of action. Regarding the cause itself of this drastic survival decrease at day 14 in both control and Nosema control, we observed a similar pattern of sudden survival decrease in a preliminary trial (data not shown), although to a lower extent. We would hypothesize that maintaining honey-bees in cages fed without protein intake (i.e., pure 1:1 sugar syrup) triggered microbiota dysbiosis and in turn gut inflammation. In the probiotic fed groups, it is very likely that both anti-microbial effects and positive immune response stimulations, which were demonstrated for both Bactocell® and Levucell SB®, in alternative host organisms (Qamar et al., 2001; Standen et al., 2013), mitigated gut dysbiosis, thus increasing survival rate. Then, from day 15 onwards, we observed significant differences regarding survival differential between curative groups (i.e., Nosema + probiotic vs. Nosema control) and prophylactic groups (i.e., probiotic vs. control; Table 7). Basically, survival differential between curative and prophylactic groups varied from one experimental group to another, and from one sampling time to another. This result suggest that under curative use, at least three out of the four tested probiotic strains had a non-additive effect on survival relative to prophylactic use. Therefore, although it may suggest these three probiotic strains exert a specific effect on Nosema activity, further experiments are needed to univocally assess whether there is a direct functional interaction with the parasite. Table 7. ANOVA single factor analysis of variance was performed to test whether significant differences in terms of survival occurred between prophylactic and curative administration of probiotics (significant p-values < 0.05). Finally, despite of the significant increase of survival rate in curative groups, no significant reduction of Nosema spores was observed in any of the four probiotic groups. At first sight, this result may be surprising as significant decreases of N. ceranae spore loads were recorded in previous studies: Baffoni et al. (2016) combined several strains of microorganisms isolated from the honeybee gut and found that both Bifidobacteriaceae and Lactobacilliaceae strains were correlated with a significant decrease of N. ceranae spore loads. Maggi et al. (2013) also reported a 52% reduction of N. ceranae spores per bee following application of the bacteria L. Johnsonii metabolites in caged bees. Finally, Corby-Harris et al. (2016) documented a significant reduction of Nosema spores following the administration of the endogenous strain P. apium. However, two key parameters from these previous studies are different from those of the present work, and could explain, at least partly, contrasted results in terms of spore reduction. First, relatively low titers (ranging from 1.103 to 1.104 spores per microliter of sugar syrup) of N. ceranae spores were administrated to caged honey bees to induce nosemosis (Maggi et al., 2013; Baffoni et al., 2016; Corby-Harris et al., 2016). Here, administrated N. ceranae spore titer was 100 to 1,000 times higher (1.106 spores per microliter of sugar syrup). Second, probiotic titers administrated in the present study were 100 to 1,000 times lower to previous studies (Baffoni et al., 2016; Corby-Harris et al., 2016). Interestingly, Corby-Harris et al. (2016) administrated a closely related strain of the endogenous symbiont P. apium at 2.106 CFU per mL, which is two thousand times higher than what was administrated in the present work. Despite of this, N. ceranae titers remained high enough, that the statistically significant reduction of spores recorded in those previous studies was not biologically relevant (Alberoni et al., 2016) to clearly reflect an antagonistic effect on nosemosis, as reduction of spore load did not exceeded 40%, when compared to infected control group. Indeed, workers from infected colonies exhibited mean nosema counts ranging from 0.04 to 1.87.106 spores per bee (Traver and Fell, 2011). In the caged bee trial of Corby-Harris et al. (2016) however, the probiotic fed group housed a mean of 951.106 spores per bee. Also, no survival improvement was recorded in all experimental groups (Corby-Harris et al., 2016). This is not surprising when considering our results as significant differences in survival were observed after 14 days, whereas the duration of the challenge with Nosema spores in Corby-Harris et al. (2016) was 10 days. A peak of bee mortality at day 14 post infection was previously observed (Dussaubat et al., 2012) thus corroborating our results regarding N. ceranae infection dynamics. More importantly, the probiotic feed additive administration protocol used by Corby-Harris et al. (2016) was quite different from the present study. Corby-Harris et al. (2016) administrated P. apium probiotic strain (2.106 CFUs) during 7 weeks into the pollen patty on colony overwintering, and thus, prior to the cage bee trial. In our experiment, probiotics strains (1.103 CFUs per mL) were administrated via sugar syrup during the cage trial. Then, in the caged bee trial, young honeybees had ad libitum access to unsterilized pollen patty. Such protocol could have further improved overall survival, by providing bees with both proteins and other bacterial strains. Furthermore, Corby-Harris et al. (2016) used young spring bees from the overwintering hives for their cages experience, whereas we used winter bees. 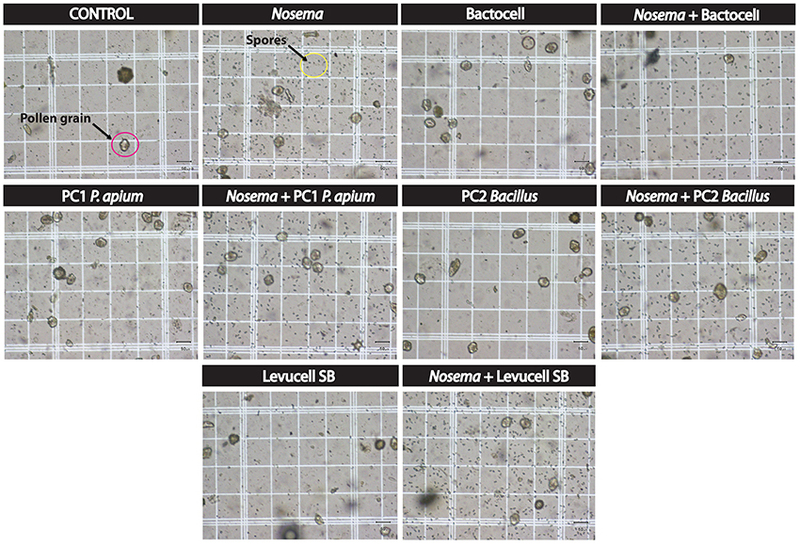 Taken together, the higher load of Nosema spores combined with lower concentration of probiotic candidates and the lack of protein supply in the present work, likely explain the absence of spore load decrease. However, all the four probiotic candidates significantly improved bee survival by 20–40%. Although it is yet not possible to state whether probiotic effects could directly or indirectly interfere with Nosema functional activity, it is reasonable to hypothesize that probiotic effect allows honey bee to better tolerate high loads of Nosema spores. Functional interaction of N. ceranae with honey bee was essentially investigated by focusing on enzyme regulation involved in detoxification process, immune response, and the metabolism activity. At the gene-expression level, honey bee midgut responded to N. ceranae infection by increasing oxidative stress pathway with the concurrent synthesis of antioxidant, defense, and protective molecules (Dussaubat et al., 2012; Di Pasquale et al., 2013). At the proteomic level, differential abundance of proteins associated to metabolism, response to oxidative stress, and apoptosis were measured between sensitive and resistant honey bees (Kurze et al., 2016). Other studies focused on other genetic mechanisms such as microRNA, which were suspected to regulate host honey bee metabolism related genes in response to N. ceranae infection (Huang et al., 2015, 2016). Overall, honey bee health is a complex system resulting from a combination of functional interacting networks between the bee host, the symbiotic gut microorganisms (Anderson et al., 2011) and the pathogens (Schwarz et al., 2015). To this respect, symbiotic gut microorganisms play a central role in modulating energy reserves and immune system development, which are key actors for host defenses against parasites (Habtewold et al., 2017; Knutie et al., 2017). Immune resistance mechanisms can either prevent parasites and pathogens from invading or eliminate them after invasion. Contrastingly to resistance mechanisms, immune tolerance mechanisms primarily involve both a lowered responsiveness to a given immune stimulus, and the initiation of tissue repair processes to protect the host from damage caused by the pathogen (Habtewold et al., 2017). Honey bee tolerance regarding high N. ceranae spores was documented in Huang et al. (2012), where a lower mortality rates were correlated to an up-regulated immune response in tolerant honey bee colonies day 6 post infection, when compared to control groups. Therefore, a balance between immune resistance and tolerance mechanisms ensures protection from parasites and/or pathogens and, at the same time, limits the tissue inflammation that may arise as a result of excessive immune effector production. As it is now suspected that host microbiota is fully involved in both resistance and tolerance mechanisms (Vitetta et al., 2016), it is worth reviewing known prophylactic and curative effects of both commercial probiotic strains tested in the present study. Commercial strains are administrated to a wide panel of host organisms as food additives to increase zootechnical performances by improving both metabolism and immune response (Denev et al., 2013; Schoster et al., 2013; Hou et al., 2015). To this respect, Bactocell® (P. acidilactici) was demonstrated to exert a protective action by stimulating the intestinal mucosal cells activity inducing a positive response of the immune system of the tilapia (Oreochromis niloticus; Standen et al., 2013). Overall, administration of lactic acid bacteria (LAB) acts as an inhibitor of bacterial infection propagation by activating the host immune system (Servin, 2004). Interestingly, it was observed in mammals that administration of LAB has the potential to alter gut microbial diversity, affect intestinal barrier function, and modulate innate immune response (e.g., via NF-κB pathway regulation) by increasing mucosal barrier function, thus leading to a decrease in translocation of bacteria and a subsequent decrease in the ability of pathogenic bacteria to attach to the gut mucosa (Reiff and Kelly, 2010). As insects and mammals share the same NF-κB mediated induction of innate immunity (Hoffmann et al., 1999), one of the putative mechanism underlying survival improvement would be that Bactocell® (P. acidilactici) may exert an effect on the honey bee immune system itself rather than directly interfere with Nosema activity. Then, other mechanism favoring honey bee survival may be involved. Lactic Acid bacteria (LAB) produce active antimicrobial molecules such as bacteriocins, antibiotics, hydrogen peroxide, to name a few. Those excreted molecules can control growth and/or survival of surrounding microorganisms, including viruses, bacteria, yeast, fungi, and protozoan parasites (Cleusix et al., 2007). Also, by lowering the local intestinal pH with lactic acid, LAB are able to inhibit growth of acid-sensitive organisms (Wohlgemuth et al., 2010). Saccharomyces cerevisiae boulardii strains, to which belong Levucell SB®, are nonpathogenic yeast which have proven experimental effectiveness in preventing and curating diseases with a predominant inflammatory component, thus indicating this probiotic might interfere with inflammatory induced cellular signaling pathways (Palma et al., 2015). Saccharomyces cerevisiae boulardii strains have a broad anti-pathogenic action, due to its outer surface molecular profile, which attaches to pathogenic bacteria such as Escherichia coli and Salmonella. Furthermore, S. cerevisiae boulardii is able to effectively compete with and displace parasitic yeast strains such as Candida (Tomičić et al., 2016). S. cerevisiae boulardii also produces anti-fungal substances such as capric, caprylic, and caproic acids, which were proven to inhibit pathogenic yeast growth in its close environment. Finally, S. cerevisiae boulardii promotes the secretion of immune molecules (e.g., IgA), which decrease the action of pro-inflammatory cytokines pathways generated in response to pathogenic bacteria, toxins and antigens (Qamar et al., 2001). Although little is known about the efficacy of S. cerevisiae boulardii against protozoan parasites, three studies documented a significant effect of this probiotic against amoebiasis (Dinleyici et al., 2009), giardiasis (Besirbellioglu et al., 2006), and infection with Blastocystis hominis (Dinleyici et al., 2011). Finally, Lee et al. (2007) documented the combination of P. acidilactici and S. cerevisiae boulardii on coccidiose. However, the molecular mechanism remains to be characterized. Overall, experimental studies on both bacterial and yeast probiotic action against parasites involving the secretion of an active principle that can inhibit parasite development was only documented for Cryptosporidium, Giardia, and Eimeria, even though the molecular nature of the active component is still to identify (Travers et al., 2011). This study confirms the potential of endogenous strains isolated from the honey bee as efficient probiotic candidates to improve honeybee survival. Then, we can conclude that the mortality of honey bees was not directly related to N. ceranae spore loads. Furthermore, as the experiment duration was longer enough to cover up to two parasite life cycles (6 days), it strongly suggests that all of the four probiotic strains did not exert direct antagonism effect on the parasite development. Our results, combined with the previous documented probiotic effects of strains related to our four candidates, suggest that mechanism of action is more related to tolerance, rather than resistance against the parasite, potentially by improving the immune system and tissue repair processes to protect the host from damage caused by the parasite. Also, our results, combined with the other experimental infection trials with N. ceranae suggest that both Nosema inoculated titers and probiotic strains concentrations have to be taken into account to properly interpret results, as different mechanisms of tolerance or resistance are potentially involved. Finally, these encouraging preliminary results for the four probiotic candidates were obtained in vivo with minimal nutritional inputs (e.g., no proteins); therefore in situ validation is necessary to fully assess the potential of these probiotic candidates as sustainable preventive and curative tools against nosemosis. Extended studies are definitely needed to understand the mechanisms underlying the functional interaction between the honey bee, its microbiota, the probiotic strain and the parasite. The metatranscriptomic approach, which consists in our case to measure the gene expression level of all organisms inhabiting the honey bee gut microbiome, including host epithelial cells, is straightforward to better understand the molecular mechanisms underlying the improvement of honey bee survival. PG and ND wrote the grant, conceived the experiments, supervized all the experiments, and wrote the manuscript; SE performed data analyses, bacterial cultures, endogenous strains molecular identification, and wrote the manuscript; AR performed the caged bee trials and wrote the manuscript; AL performed Nosema spore counts and statistical analyses; BC supervized statistical analyses; SB performed bioinformatic analyses to identify endogenous probiotic strains and designed primers for PCR detection; VD and MC provided their expertise in probiotic development along the project and co-write the manuscript; P-LM was involved in every steps of molecular biology protocols (bee dissection, DNA extraction, PCR, sequencing) and probiotic cultures. This work was funded with the Agri-Innovation programme from Agriculture and Agri-Food Canada. Grant number: 14-AP-247. Authors are grateful to Agriculture and Agri-Food Canada (AgriInnovation program PAI-P199) and Lallemand Inc. for funding this study, as well as the Centre de recherche en sciences animales de Deschambault, Laval University and the Institute for Integrative and Systems Biology (IBIS). Authors would also like to thank Amélie Bégin, Pierre Mermoz for laboratory assistance. Alak, J. I., Wolf, B. W., Mdurvwa, E. G., Pimentel-Smith, G. E., Kolavala, S., Abdelrahman, H., et al. (1999). Supplementation with Lactobacillus reuteri or L. acidophilus reduced intestinal shedding of cryptosporidium parvum oocysts in immunodeficient C57BL/6 mice. Cell. Mol. Biol. 45, 855–863. Andrearczyk, S., Kadhim, M. J., and Knaga, S. (2014). Influence of a probiotic on the mortality, sugar syrup ingestion and infection of honeybees with Nosema spp. under laboratory assessment. Medycyna Weterynaryjna 70, 762–765. Castex, M. (2009). Evaluation of Probiotic Bacteria Pediococcus Acidilactici MA18/5M on Penaeid Shrimp Litopenaeus stylirostris in New Caledonia. Doctoral dissertation, AgroParisTech. Chomczynski, P. (1993). A reagent for the single-step simultaneous isolation of RNA, DNA and proteins from cell and tissue samples. Biotechniques 15, 532–534. Denev, S., Chevaux, E., and Demey, V. (2013). “Efficacité du probiotique Pediococcus pediococcus acidilactici sur les performances zootechniques de poules pondeuses,” in Conference Paper. JRA JRFG, 943–946. Available online at: https://www.researchgate.net/publication/235984461_EFFICACITE_DU_PROBIOTIQUE_PEDIOCOCCUS_ACIDILACTICI_SUR_LES_PERFORMANCES_ZOOTECHNIQUES_DE_POULES_PONDEUSESQ (Accessed November 16, 2017). Fernandez, N., and Coineau, Y. (2007). Maladies, parasites et autres ennemis de l'abeille mellifère. Biarritz. Hyrsl, P., Dobes, P., Vojtek, L., Hroncova, Z., Tyl, J., and Killer, J. (2017). Plant alkaloid sanguinarine and novel potential probiotic strains Lactobacillus apis, Lactobacillus melliventris and Gilliamella apicola promote resistance of honey bees to nematobacterial infection. Bull. Insectol. 70, 31–38. Lallemand (2016). Lallemand Animal Nutrition. Available online at: http://lallemandanimalnutrition.com/fr/europe/nos-produits/details/bactocell/ and http://lallemandanimalnutrition.com/fr/europe/nos-produits/details/levucell-sb/ (Accessed 2015). Copyright © 2018 El Khoury, Rousseau, Lecoeur, Cheaib, Bouslama, Mercier, Demey, Castex, Giovenazzo and Derome. This is an open-access article distributed under the terms of the Creative Commons Attribution License (CC BY). The use, distribution or reproduction in other forums is permitted, provided the original author(s) and the copyright owner are credited and that the original publication in this journal is cited, in accordance with accepted academic practice. No use, distribution or reproduction is permitted which does not comply with these terms.